The Two Lasses teach both an in-depth fusing class for beginners and a more advanced course for those who already have fusing experience and are wanting to learn the art of dichroic glass jewlery-making. Our exciting workshops will introduce you to a variety of interesting techniques and are appropriate for both a beginner or the more experienced warm glass hobbyist. For dates and details, please click on the links below. Learn the art and craft of kiln-worked glass in this exciting one-day comprehensive class! Click here to see a complete description and a class schedule! Join the Lasses to experiment with different warm glass techniques in order to create beautiful and functional works of art. By appointment only. No previous experience necessary! Learn how to create exquisite dichroic fused glass jewelry adornments in our exciting series of two, half-day classes! Basic fusing experience is required for this class! To register for our classes or workshops, please proceed to the appropriate page (by clicking on the links above) where you will find the information you need to reserve your place in our classes. 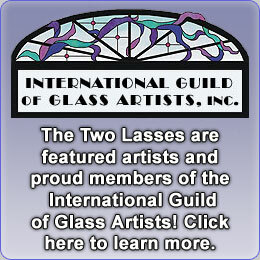 For any other questions, please contact the Lasses at twolassesglass@yahoo.com or at (941) 923-3773. Private, in-studio instruction is also available and we can also accommodate special groups. We are located in Sarasota, on Florida's beautiful Gulf Coast. 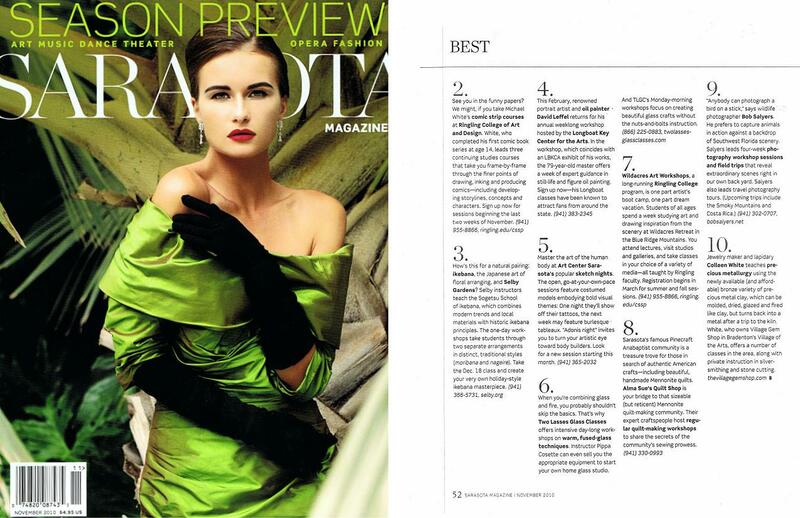 Two Lasses Glass Classes is proud to have been chosen by Sarasota Magazine as one of the 10 best creative art classes in Sarasota!